As nearly 50% of the land in Oregon and Washington is publicly-owned, and most of these lands are several hours drive from the major population centers, there is ample opportunity for day hiking in remote and seldom-visited spots. If you enjoy solitude and exploring “off the beaten path,” these day hikes are for you! 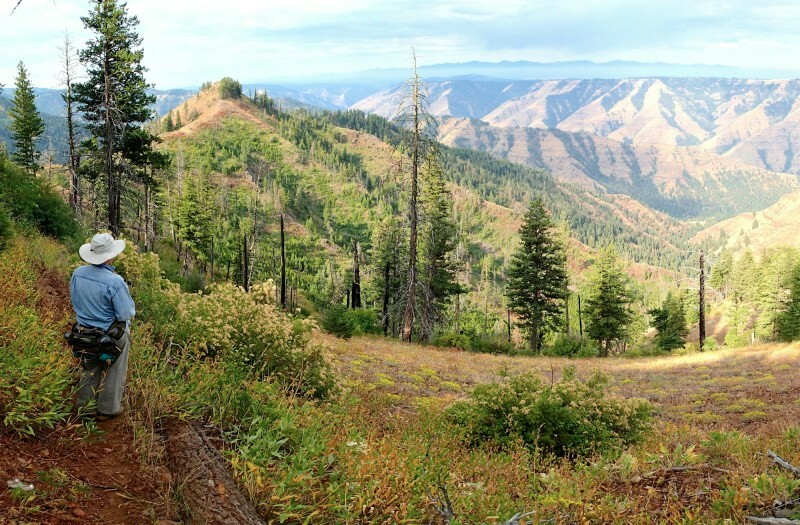 Our sole focus is the Inland Northwest — Forest Service (USFS), Bureau of Land Management (BLM) and State lands in Eastern Oregon and Eastern Washington. To date, you’ll find 95 day hikes here covering over 580 trail miles in total. As of April 2017, we are no longer adding new hikes to this website (advancing age is catching up with us!). However, we will continue to update the existing hikes, as best we can. We welcome your suggestions from the field for any updates to our existing hike descriptions! These day hikes are distributed across Central Oregon (20 total), Southeast Oregon (23 total), Northeast Oregon (32 total), Southeast Washington (11 total) and Northeast Washington (9 total). The hikes are mostly moderate to easy, but their locations are remote, wild and seldom-visited. They range from well-established trails that are little used, to cross country rambles that are never used. Most follow a stream or river canyon, while others lead to a scenic rim or promontory. A few do both! Four-wheel drive is rarely required to reach any of these trailheads, but a sturdy, high-clearance vehicle is essential for many of them. These hikes are best suited for those willing to trade the ease and convenience of popular campgrounds and trails for the self-reliance, natural beauty and solitude found at more remote and obscure recreation sites. Please enjoy — and protect our valuable public lands!